When ones birthday falls on a Friday, one should really take advantage of such fine timing and have a little birthday gathering. This is what happened to me last Friday. And so, we invited people and had a party. It was a wonderful time. The boys each had some friends over so all ages were entertained. There were sweet and sour meatballs that I had prepared and simmered in the crockpot all day as well as some other snack-type foods for nibbling. And a massive Costco chocolate cake (of which its leftovers makes a fine accompaniment to morning coffee). 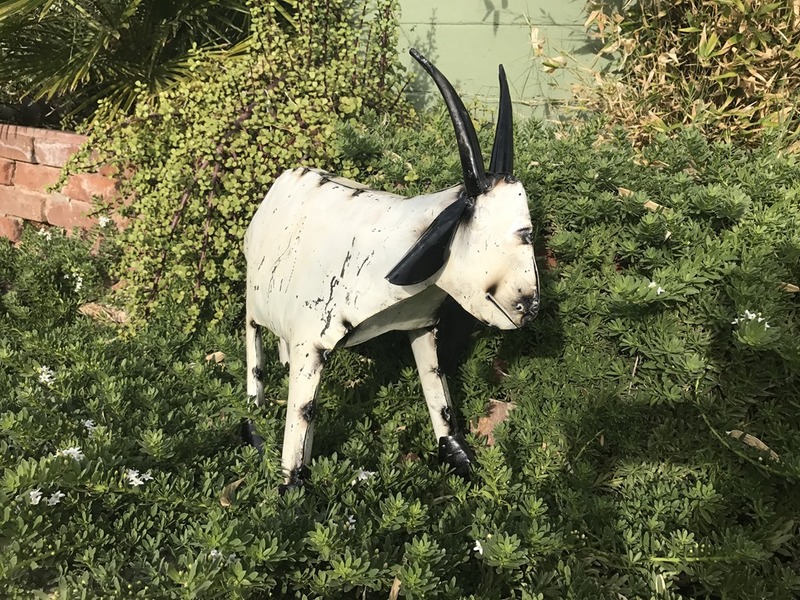 As a birthday present for myself, I stopped by our local plant nursery and picked myself up a goat. I have simply named him Birthday Goat. Friday birthdays with gifts of goats are grand! This entry was posted in Simple Sunday and tagged Age, Birthday Goat, Birthdays, Family, Fridays, Friends, Life. Bookmark the permalink.